Andrew Costello (Co-Executive & Co-Artistic Director ) brings with him a wealth of performance experience, having sung more than 25 leading operatic roles in the United States and Europe. Critics have consistently recognized his outstanding talent. Mr. Costello’s career began with Glimmerglass Opera. 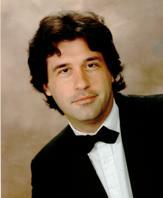 He has since appeared with, among others, the Atlanta Opera and Des Moines Metro Opera. As a concert soloist, Mr. Costello made his New York debut at Carnegie Hall. Mr. Costello’s career in Europe was launched when he joined the prestigious International Opera Studio of Zürich. This success was followed by appearances with Cologne Opera, Bremerhaven Opera, the Neubrandenburg Philharmonic, Mecklenburg Landestheater, Stadttheater Giessen and the Tiroler Festival in Austria. Mr. Costello has sung with many important conductors such as Anton Coppola, JérÔme Pillement, Jane Glover, Frédéric Chaslin, Stewart Robertson, Dr. Gustav Kuhn, and Dr. Robert Larsen. Notable performances include The Flying Dutchman, Bluebeard, Pizarro in "Fidelio", The Four Villains in "Tales of Hoffman", and Scarpia in "Tosca".